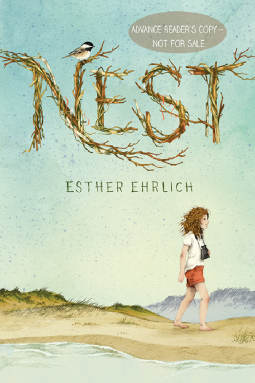 Nest by Esther Ehrlich (Random House Children’s Books; published today!) is an emotionally charged novel about a young girl facing stark change after her mother develops a serious disease. Naomi, “Chirp” to her family and friends, is a bird-loving sixth grader on Cape Cod in the early 1970s. Her life is full of nature and her loving family. As her family struggles with her mother’s degenerative condition, she must grow up faster than she intended. Her best friend becomes Joey, the classmate who lives across the street. As she provides ways to protect Joey from his bully brothers and physically abusive parents, Joey provides Chirp with the friendship she needs now that her mother is not acting like herself and her sister and father are distracted in other ways. Parents should know that Nest has serious content includ (*spoilers*) abusive situations, serious mental illness, and suicide. It is a serious book for kids ready to address such issues. Keep the dialog open, because mental illness in 1972 was treated much differently than it is today. That said, Nest is about far more than mental illness and suicide. It is a book about family, friendship, and finding peace in the midst of a world different from expectations. For me, a reader (albeit an adult) who likewise struggles with depression (albeit in a different era), Nest was poignant because of how close to home it felt. How can I provide a nest of comfort and love for my children when they may face depression themselves? How can I create comfort in the midst of life’s storms? The writing in Nest was superb. Although it was in present tense, something that ordinarily bothers me, Ms. Ehrlich pulled it off well, with flashbacks and reflections as necessary to avoid the awkwardness that sometimes comes from straight present-tense stories. I like the hints of the ’70s throughout as well. It was a different era, but the innocence of childhood still was lost when tragedy and difficulty struck family. All around, Nest was a fantastic read. Note: A digital copy was received for review consideration. This sounds wonderful and sad. Definitely going to check it out.